art and design. Their inspiring interdisciplinary work opens up a path for creative leaders and one into our next issue, which will highlight the results of Parsons’ hybrid, boundary-blurring approaches to making innovative products, experiences, and scholarship. 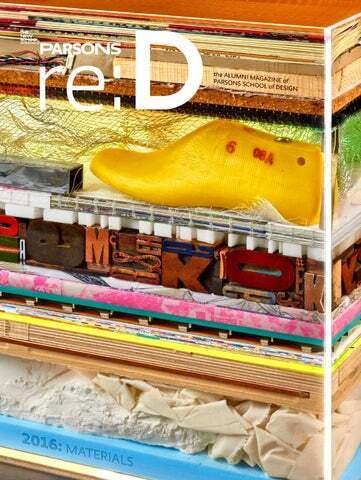 ABOUT THE COVER For this issue’s cover, designer David Robinson created what he calls a “core sample of Parsons creativity” by repurposing discarded material collected from the various labs composing the new (and developing—see page 24) Making Center network. Each stratum represents one of the materials involved in creating outcomes ranging from data visualizations to published books to constructed environments. Some materials, like cork, are long-standing, renewable choices while others, such as blue foam, are in dire need of replacement. 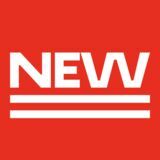 For a complete list of the materials shown on the cover, visit newschool.edu/red/2016. Parsons Reunion and Alumni Exhibition Opening 2016 is Saturday, October 15. Learn more at newschool.edu/parsons-reunion. Arts ’08 (Eugene Lang College of Liberal Arts). Sunwoo’s website is shown above (center). and Recreation Center in Washington Heights. for students to design and build for nonprofits. and Impact! at South Street Seaport (May 9). the carts’ ingenious design in their praise. Daniel R. and Sheryl Tishman, and the John L.
“In my design, it is important that time and material, energy and economy, are factored in. Zero-waste practice includes creating multifunctional designs that can be worn everywhere for a long time.” This commitment has earned Teng a loyal clientele and accolades including a 2004 National Design Award from Cooper Hewitt, Smithsonian Design Museum, and a place in the permanent collection of The Metropolitan Museum of Art. readers to discover stories as participants instead of observers. suddenly comes to life, and graphic models and maps shift and rotate, depicting the snowy terrain that victims and rescuers faced. “My job is to take the meaningful parts of a narrative and connect them in visually exciting ways,” Myint says. “But more than that, I have to let the story tell itself.” In her work, digital storytelling is an innovative and experiential, if fleeting, invitation into new worlds. Charlotte Strick, AAS Graphic Design ’99, jokes of trading “women’s jackets for book jackets.” The compelling covers she creates as a designer and art director at Farrar, Straus and Giroux and Faber & Faber attract readers to major authors—including Rachel Kushner, Roberto Bolaño, and Ishmael Beah—through their appealing expressiveness. designer and art editor of the Paris Review. She selects works by renowned artists like William Kentridge and discovers new talent to carry forward the Paris Review’s literary legacy with fresh, modern artwork. To illustrate Rachel Cusk’s story of a dissolving marriage, Strick commissioned artist Samantha Hahn to create the monochrome pen-and-ink cover shown here and interior drawings whose bleakness and indistinct contours suggest a disintegrating relationship. “You have to supply the connections,” says Bob Sikoryak, BFA Illustration ’87. He is discussing the challenge of his latest illustration project—iTunes Terms and Conditions: The Graphic Novel. Because his absurdist parody of Apple’s lengthy contract lacked a traditional narrative, Sikoryak made Steve Jobs a through-line to connect the scenes. Each panel features Jobs rendered in the style of a popular cartoonist like Roz Chast, Matt Groening, or Lynda Barry. The book originally appeared on Sikoryak’s Tumblr before circling the Web and being printed as a limited-edition chapbook. In Sikoryak’s iTunes Terms and Conditions, Steve Jobs wanders through fantastic universes, fighting enemies against a background of Apple’s legalese. He recently adapted the piece into a live performance. Kalil Endowment for Smart Design Student Grant, the James Dyson Award, and university support to present at the 2016 Design Indaba conference in Cape Town. for production while working on other projects. Good Challenge and is currently in UNICEF’s accelerator program. zine’s editorial director, and Reign Apiim ’11. honoring Italian fashion pioneer Elio Fiorucci. Jasmine Young, and Carly-Ann Fergus (shown) organized Fashion and Diversity, events initiating an inclusive dialogue engaging a range of practitioners, writers, scholars, and students. Melander & Johanna Öhlén Meschke); Emerging Voices at SCE speakers (Lyn Rice, Yolande Daniels, Ali Tayar, Marc Tsurumaki, Claire Weisz; cyborg Neil Harbisson (Science, Technology, Engineering, Arts, and Mathematics [STEAM] lecture). participant in the Parsons Scholars program, a three-year college prep and art and design curriculum for local high school students, and then as an undergraduate. In his studies, he explored another set of borders, working at the intersection of apparel and art direction by completing theses in both fashion design and communication design. “I wanted to reimagine garments, the materials they’re made from, and present them in arresting ways.” Today Wan employs his impressively broad interdisciplinary practice as a menswear designer at Thom Browne. While working with professors such as Dr.
Design, a branding and packaging design firm. ways. Over the years, he has employed alumni and consistently hired student interns. “I want to offer students the kind of career support I received,” he says. whom are laborers outside of the United States. challenged students to chart statistics of disparities in education, food access/agriculture, wages, and life expectancy in African nations. childhood marriage to development indexes. textile enthusiasts, and industry experts. NY); and Royce Epstein (Mohawk Group, GA). NEW FACULTY Award-winning designer-educators Anthony Dunne and Fiona Raby have joined Parsons’ faculty to advance university-wide design research on the implications of technology. As professors of design and emerging technology, they will work closely with The New School’s Graduate Institute for Design, Ethnography & Social Thought (GIDEST). Their work has been exhibited worldwide and is part of the collections of MoMA and the Victoria and Albert Museum. Innovation and co-creation specialist Lisa Norton joins the university as professor of design leadership at Parsons School of Design. Norton brings to the college a background in integrated humanistic design and fine arts. Gyungju Chyon is a multidisciplinary practitioner with extensive experience in the design of objects and environments. She joins SCE as assistant professor of product and industrial design. which captured students’ responses to COP21. Tan, Grassroots Global Justice Alliance delegate. addressing climate change and social justice. leading to a better future,” said Towers. 35-year career, will be on view at the Erie Art Museum beginning in June. Simone, created using 8x10 Polaroid film. Printed on Japanese paper. Parsons’ faculty, alumni, and students are putting human and environmental health at the center of materials development and design practice. Learn how they are leading change in materials-intensive industries including architecture, interior design, and fashion design—and raising awareness about our increasingly problematic material world. t its best, modern innovation has produced substances harder than diamonds and colors darker than black—but it has also given us ubiquitous materials that present profound and wide-ranging ethical and environmental problems, not to mention threats to animal and human health. complex, in part because harm can happen at all points on the supply chain. We now know that substances such as plastics and some paints can be toxic. But ostensibly safe materials can also create damaging byproducts or require unsafe substances to synthesize, causing health problems for the people who produce or distribute them. Other materials become toxic as they degrade, leaching into the food chain through the sea and soil. On top of all this, materials and consumer goods manufacturers are notorious for their waste and often hazardous factory conditions. Foundation, HML has the goal of radically reducing toxicity in building materials— particularly those used in affordable housing—increasing transparency about materials’ chemical makeup, and advocating for affordable alternatives through research, education, and materials development. presented by everyday substances, HML adopts an interdisciplinary approach to a targeted area: constructed environments. Because we spend much of our lives indoors, it is through interiors that we most regularly encounter potentially harmful chemicals, from the paint on walls to sealants and plastics—all highly ingestible or inhalable through their fibers, gases, and dusts. and what inspired her to join the project—is its interdisciplinary and outcomes-oriented approach, a key asset in closing “the gap between design practice, theory, and research to work toward implementing systemic change. As designers, we’re responsible for having positive effects on the environments and people we work with. HML makes of physical products to include systems thinking and the numerous layers—social, political, economic—involved in health and the built environment.” HML plans to Right: Alison Mears, director of the Healthy Materials Lab (HML); left: Larissa Begault, MA Theories of Urban Practice ’15, a research fellow at HML. the product throughout its manufacture and distribution. underway at HML and elsewhere. to be an urgent concern, says Mears. New York Fashion Week [see below], I dyed the fabric in both pink and black to create the dirty pink color I wanted. I accidentally got large black splotches all over the fabric. perform well when joined in a garment. “You can’t use sustainability as an excuse for bad design. Whatever you propose needs to be compelling, viable, and beautiful.” —Timo Rissanen, Assistant Professor of Fashion and Sustainability challenging production models: “fast fashion” at the low end of apparel production and seasonality at the high end. And as the fashion industry grows as an economic force, the pressure to produce more, faster, increases. John Haffner Layden writes about art and design for print and online outlets. left: Valerie Grapek, a BFA Fashion Design student. Amelia Stein is New York–based and writes about design and architecture for The Guardian (U.S.) and Architectural Review. SILKSCREEN Print Shop Encompassing a range of processesâ&#x20AC;&#x201D;including silkscreen, lithography, etching, and letterpressâ&#x20AC;&#x201D;the print shop enables students to explore both traditional and contemporary methods of graphic production. DUBIED MACHINE Knitting Lab A student learns industry production techniques on a flatbed knitting machine. New digital knitting equipment will be part of the Making Center facilities, enabling students to create using professionalgrade technologies. 3D PRINTERS Rapid Prototyping Shop Students of all disciplines learn to use 3D modeling software to produce prototypes in a range of materials; these versatile tools help creators explore new possibilities in manufacturing. equipment, 3D printers, computer-aided textile equipment—and traditional ones. Shown on these pages are examples. A view of the raw space in Parsons’ building on the corner of Fifth Avenue and 13th Street before renovations began this winter. Details revealed in the demolition—vaulted ceilings, wood floors, and brick walls— will surround a new generation of creators with the work of makers past when the space is outfitted and open in fall 2016.
laboratory where students, faculty, and industry leaders will develop new materials and products, prototyping and manufacturing methods, and collaboration techniques Increase support for our faculty and students through endowed professorships and scholarships Ensure promising NYC public high school students’ access to design education through funding for the Parsons Scholars program Support the Parsons Design Lab, which facilitates innovative research and entrepreneurship Provide accessible funding for the areas of greatest need Join the campaign and help secure Parsons’ prominence and reputation for making a difference in the world by design. Join the campaign by making a gift to the Parsons Annual Fund today at newschool.edu/giving-back. Development and Alumni Relations, at 212.229.5662 x3041 or appelm@newschool.edu. Together we’re making Parsons—and making a better future. Kevin Cremens (Portfolio), Jonathan Grassi (Portfolio), Courtesy of Henry N. Abrams Publishing (Portfolio), Kimber Jauss (Portfolio), Sara Jimenez (Red Handed), Courtesy of Kellen Archive (The Second Skin), Sameer Khan (Portfolio), Courtesy of Macmillan Publishers (Portfolio), Matt Matthews (Portfolio), Will McHale (Future in the Making), Courtesy of © Raymond Meier/ Trunk Archive (Portfolio), Courtesy of New York Times (Portfolio), Courtesy of the Paris Review (Portfolio), Jose Picayo (Portfolio), Gianni Pucci (Portfolio), Louise Victoria Reinke (Portfolio), David Robinson (Table of Contents), Martin Seck (Cover, Portfolio, The Material World, The Second Skin, Future in the Making, Giving), Marc Tatti (Portfolio), Zhi Wei (The Material World), Mathew Zucker (Portfolio) The New School does not discriminate on the basis of age, race, color, gender, sexual orientation, religion, religious practices, mental or physical disability, national or ethnic origin, citizenship status, or veteran or marital status. The New School is an Affirmative Action/Equal Opportunity Institution.